Often if wanting to braise a meat I will first start with sauteing some diced onion and mushroom in a heavy saucepan add kosher or sea salt & fresh ground pepper in good quality olive oil, cook onion and mushroom till golden brown over a medium heat, add more oil before continuing. Dredge approximately 1″ thick x 8″ long top or eye round steak in flour, add to the hot pan and gently seared on both sides. After each side of the top round steak is lightly browned add about 1/4 cup dry red wine & 1/8 -1/4 cup warm fresh water, cover with lid and bring terracotta pan to boil, then lower heat to simmer and cook for 50-65 minutes. Note: the braising liquid in pan should not cover the meat but be about half way up. Check a few times and turn meat over after 30 minutes, add warm fresh water if needed. Cooking times may vary depending on the size, thickness and cut of beef. Ideally, the beef should be able to be broken easily with a fork and will be most enjoyable if you allow enough time to achieve this result. Serve with either rice, risotto or potato and some braised greens vegetables such as kale, escarole or collards for a rich, healthy dinner. A good quality Cabernet Sauvignon is a good accompaniment. 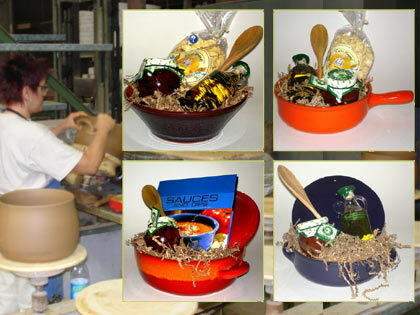 Eco-Friendly Italian Made Terracotta Cooking & Serving Wares. Earthy Orange October’s colors for your Kitchen & Table! Hi, isn’t it time you tossed your metal cookware and experienced better flavors, easy clean, light weight and energy efficient Piral Italian Made Terracotta Cooking & Serving Ware. Click on the Facebook like (thumbs up) and Terra Allegra Imports will reply with 25% off promo code today.